Description: Pure white Mangalitsa leaf lard is the best baking fat ever, according to Ruth Reichl, acclaimed chef, food writer and host of PBS’s Gourmet Adventures with Ruth. Mangalitsa leaf lard produces the lightest, flakiest crust — Bakers cherish Mangalitsa Leaf Lard because it creates magical crusts and cakes. And because of its high smoke point, Mangalitsa leaf lard is perfect for frying and sauteing, allowing the natural flavors of your ingredients to shine. 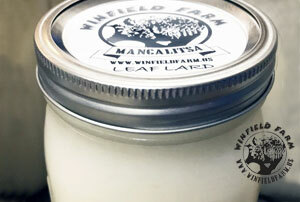 Store leaf lard in the refrigerator. Shelf life is 12-18 months when refrigerated. Pork lipids are an important source of conjugated linoleic acid, which in light of recent studies can provide protection against some forms of cancer and heart disease because of its antioxidant properties. Pork is an excellent source of vitamins and trace elements, ensuring between 10% (pantothenic acid) and 65% (for thiamine – vitamin B1) of daily recommended dose. It is also an excellent source of pyridoxine, cyanocobalamin, biotin, niacin – soluble vitamins necessary for healthy metabolism. Minerals contained in pork provides between 9% (for iron) and 36% (for zinc) of the recommended daily dose, but also of phosphorus and magnesium. Mangalitsa fat content is 12-16% less saturated fatty acids and 8-10% more unsaturated fatty acids (like n-3 and n-6) than the modern pig breeds. Significant differences were recorded among ratio content of saturated and unsaturated fatty acids in Red and Blonde Mangalitsa (35.88% and 38.42% respectively). In comparation with other modern breeds both Mangalitsa had a higher ratio of unsaturated fatty acids.